You do not know what you are missing. 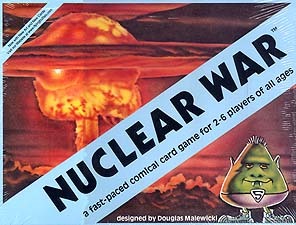 Alright the game has been around for a long time but the look it takes at nuclear war is very satirical, which applies as much today as it did when it was first relased. It is nothing like the friendly german games of today, the whole objective is to destroy your opponent. You do this by throwing nuclear warheads at them, spreading malicious romours and various other under hand tatics. This is a comic game of cataclysm where you try to be the lone survivor of global thermonuclear meltdown. In this card game you use your wile (and your cards) to sway people from you opponents countries to yours. When this fails there is nothing left to do but declare an all-out nuclear war. The design of this game dates back to the 60s during the height of the Cold War. The original game included around 100 cards for play. Note : This game CAN be played by itself, with Nuclear War, Weapons of Mass Destruction, Nuclear Escaltion, or with all four games combined for quadruple the fun!!! !